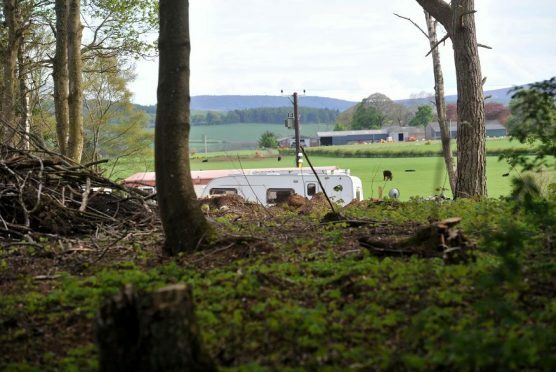 Aberdeenshire Council narrowly voted to refuse planning permission to plans for a seven-pitch gypsy-traveller site at Quarry Wood, near Kemnay, yesterday. Planners recommended the application for approval, despite 42 objections. Afterwards, Mr Stewart’s agent Alan Seath said they would appeal the decision to Holyrood, and would be seeking clarity on the council’s grounds of the refusal. He added the site would have been the home of Mr Stewart’s extended family, housing 15 adults and 15 children. The council previously took enforcement action at Quarry Wood following complaints of tree felling and development work which did not comply with permission for three lodges. But Mr Seath added Mr Stewart had made steps to engage with the local community, and argued the application “meets a need and demand in this area of Aberdeenshire”. Each of the seven pitches would have had a principal chalet, two touring caravans and a utility building – with no more than 21 caravans on site at any one time. However objector, Sir Archibald Grant, told the committee he feared more than 100 people could be living on the site at any one time. West Garioch councillor, Sheena Lonchay, moved to refuse the application, claiming the community had been “disappointed” that work had started in advance of the planning process. The independent member added: “I do have sympathy for the gypsy-traveller community, but I have no sympathy for an applicant that shows disregard for the planning process and legal process. East Garioch councillor Martin Ford unsuccessfully proposed backing the plans on a delegated grant subject to a number of changes to the development, moving the proposed stances away from neighbouring properties. Last night, a spokesman for the Stewart family said the travellers site would have provided a “safe” home for them. Alan Seath, the agent for applicant, George Stewart, said members of his family had told him the woodlands would offer “somewhere safe” where they could live “without fear of removal hanging over us”. During yesterday’s meeting, he told the council: “The site would be fore 15 adults and 15 children, from babies and toddlers to teenagers, (the) extended Stewart family. “Some are particularly vulnerable people, serious medical conditions, three babies on site. “It will reduce unauthorised camps in the area and wider Aberdeenshire. “I can’t stress enough how important this site is to the residents. A total of 30 people can live comfortably on the site.